647 South Saltair Ave., Los Angeles 49, California. Billbergia Callophylla in full bloom, about about one half actual size. This is one of the outstanding members of the genus, which can be depended upon to bloom around Christmas holidays. Outer sides of the leaves are covered with scales, producing a series of irregular cross bands. Bracts are scarlet, and the flowers are deep, purplish blue with yellow stamens. As the Bromeliad Society enters upon the tenth year of its existence, the members can look back with gratification on a job well done. To organize a specialized plant society and to keep it a going organization is no easy task, but thanks to the efforts of Mulford and Racine Foster, who nursed it tenderly during its formative years, the Society has prospered. Frank Overton, who valiantly took over the editorship for the past year, definitely demonstrated his ability as an editor of whom any society could well be proud. And Morris Hobbs should receive the plaudits of every member for stunning covers. The Society at present has a membership of over 400 – 100 of which are members living in countries other than the U. S. A. New Zealand with its 30 very active members (due to the untiring efforts of Muriel Waterman) and Australia with its 20 bromeliad enthusiasts (thanks largely to Charles Hodgson and Charles Webb) have the largest foreign representation. In Europe we have members in England, Belgium, Italy, France, Ireland, Austria, West Germany and East Germany. We send bulletins also to Central and South Africa and Ceylon and to Japan. As might be expected, we have a large active membership in Central and South America and the islands of the West Indies. During the past few months we have had several new members residing in Canada. In the United States, three states lead in membership and activity. They are Florida (90 members), California (80 members), and Louisiana (35 members). Each of these states has an affiliated society. New York with its 20 members (nearly all living close to New York City) and Texas with its 20 members should form local organizations. There are members scattered throughout Massachusetts, Illinois, Oregon, Pennsylvania, Hawaii, Iowa, Wisconsin, Washington, Virginia, West Virginia, Georgia, Kentucky, Maryland, New Jersey, Indiana, and the District of Columbia. Members desiring names of those living within their area should drop a card to the secretary. We are truly an international organization and our membership is growing steadily. We would, however, like to see it grow just a little more rapidly. Mr. David Barry, Jr., our president, has many ambitious plans for the Society, but in order to see these plans materialize he needs a larger membership. With the growing interest in bromeliads, we know that the coming year will be an important one in the history of the Society. It is our hope that all members will renew their memberships and also endeavor to get others interested in the Society. A fine series on greenhouses. containing many worth-while ideas which can be used by anyone having a greenhouse. A continuation of the "Beginner's ABC" and other helpful suggestions for the novice. A series of exciting plant adventures by those recently returned from collecting trips. News and views from our members far and near. A series on plants which members should know better. A series on new introductions. We take great pleasure in naming this distinct new species of Neoregelia in honor of R. H. and Catherine Wilson of Miami, Florida. When I visited them in 1957 to see for the first time, the living bromeliad plants which they had collected in Brasil in 1955, one of the first things that attracted my eye was a fantastic plant, familiar to me. Racine and I found it growing on rocks and trees at Agua Preta in Bahia, Brasil on our first Brasilian plant hunting expedition in 1939. We were neophytes then, experiencing our first really primeval jungle forest. It was in this jungle where we first saw this new Neoregelia. We looked in vain for some sign of inflorescence or fruit, but, although we examined many huge clusters of these plants, with long whip-like leaves, we found no trace of the floral parts. However, we did make herbarium specimens and included them in our collection. Even though they were sterile plants we hoped that Lyman Smith could identify them anyway, but, of course, this was impossible unless the plant had been previously known. For years I have felt that it was a Neoregelia species, but certainly could not prove it without floral parts. Unfortunately, the living plants which we tried to bring back, were killed by fumigation; we have always hoped to return to that area to collect the species again. The Wilsons went to Bahia and found this Neoregelia not far from the area where we had collected it. Their plants, fortunately, lived and Mr. Wilson gave me one of them; I was elated to see this interesting and mysterious species again. After some eighteen months our plant grew and matured, taking on character with offshoots coming out in all directions on short stolons. Then it finally flowered with pure white petal blades spreading out like stars in those deep, almost black, cups. Certainly, few persons would guess that this plant is a Neoregelia if they had compared the plants with the majority of Neoregelias known in horticulture. But a Neoregelia it is and a real gem for the bromeliad collector. The plant continues to flower for at least three weeks. NEOREGELIA WILSONIANA – M. B. Foster, sp. nov.
A Neoligantha L. B. Smith cui verisimiliter affinis et ab omnibus speciebus adhuc cognitis, foliorum laminis flagelliformibus differt. Stemless, propagating by numerous slender scaly stolons from. the axils of the much reduced lower leaves; leaves about 20 in a fasciculate rosette, the inner ones to 7 dm. long, sparsely lepidote beneath with fine appressed brownish scales; sheaths broadly ovate, 8-10 cm. long, green or purplish with a broad pale margin; blades flagelliform (whip-like), 2 cm. wide at base but becoming inrolled and appearing much narrower, green, concolorous, sparsely serrulate toward base with upwardly curved flat brown spines 1 mm. long; inflorescence simple, 16-20-flowered, hidden in the center of the rosette; floral bracts broadly ovate, about half as long as the pedicels thin, pale green, entire, sparsely lepidote; pedicels very slender, 22mm long; sepals short-connate, 26 mm. long, slightly asymmetric, lanceolate broadly acute, pale green, thin, glabrous; petals white, connate in a slender tube as long as the sepals, the blades spreading, lanceolate, acute, 20mm long; stamens included, almost Completely adnate to the petals; ovary ellipsoid 7 mm long. TYPE in the U. S. National Herbarium, collected in Bahia, between Ilheus and Agua Preta, Brasil, by R. H. Wilson and Catherine Wilson (No. 20), July 25, 1955. Flowered by M. B. Foster in Orlando, Florida, August 1959. Sterile specimens collected in Agua Preta, Bahia, Brasil, June 3, 1939 by M. B. and R. Foster (Nos. 52, 53, 59). Rt. 3. Box 658, Orlando. Florida. Do see to it that your bromeliads get sufficient light during the dark days of winter. If the glass of your house is heavily coated, scrape off some of the paint. With the exception of Florida and Southern California, most winter days are so gloomy that the light-reading is very low. Bromeliads are air plants, and most of them will take more light than the average person realizes. Give them all they will take–just this side of burning. Don't overwater your plants–especially those which stay outdoors. Bromeliads will take a surprisingly low temperature, but only if they are dry. Don't let your house get too dry, however. Try to maintain a temperature and a humidity reading that are about equal. Do spend this time, which for some plants is not a period of active growth, in cleaning your house and plants. Before the onset of the very cold weather, give the house a good fumigation. If your plants show an infestation of scale, two fumigations, a week or two apart, might be necessary. Parathion is deadly but is very effective and is not harmful to plants. However, it must be administered with care. At the beginning of spring another fumigation is recommended, and then usually you can sit back contentedly and know that your plants are clean and will remain so at least until fall. Don't stop your fertilizing program. Some bromeliads never stop growing, and if they are planted in a bark of some kind which contains no nutriment, they need the added boost which a good liquid fertilizer will give them. If your water is on the alkaline side, a small amount of liquid fertilizer in the water will tend to counteract effect of the salts. Do look for blooming spikes on such plants as Aechmea "Foster's Favorite," Aechmea victoriana, Aechmea racinae, Aechmea pineliana, Aechmea weilbachii, and Aechmea orlandiana. A number of Billbergias also come into flower at this season, among them being Billbergia lietzei, Billbergia iridifolia concolor, and Billbergia vittata. Do listen to the weatherman if you grow any bromeliads in the garden. They don't mind a low of 45° F., but will not be too happy if the thermometer gets into the low thirties and twenties. Do order those catalogues which feature bromeliads. They make fascinating reading for the long, cold winter evenings and will help you plan for the plants which you wish to add to your collection. GUZMANIA TEUSCHERI L. B. Smith, sp. nov.
Acaulis; laminis foliorum ligulatis, late rotundatis apiculatisque; scapo erecto; scapi bracteis dense imbricatis, late ellipticis, lepidibus pallidis appressis dense vestitis inflorescentia dense bipinnata, fusiformi vel subcylindrica; bracteis primariis eis scapi similibus sed suborbicularibus, quam spicis globosis multifloris paulo brevioribus; bracteis florigeris ellipticis, quam sepalis paulo brevioribus, sepalis ellipticis, breviter connatis, subcoriaceis, persistentibus; petalis alte conglutinatis, nudis, laminis patentibus. Stemless, flowering over 7 dm high; leaves 65 cm long, covered with appressed brown-centered scales; sheaths ample. brown; blades ligulate, broadly rounded and apiculate, 9 cm wide, flat, concolorous; scape erect, rather stout; scape-bracts densely imbricate, broadly elliptic, covered with pale appressed scales; inflorescence densely bipinnate, fusiform or subcylindric, 15 cm long, 5 cm in diameter; primary bracts like the scape-bracts but suborbicular, slightly shorter than the globose many-flowered spikes; floral bracts elliptic, slightly shorter than the sepals; flowers subsessile; sepals elliptic, 22 mm long, short-connate; petals conglutinated, unappendaged, yellow, their blades spreading, elliptic, 10 mm long; stamens included, adherent to the petals for most of their length. Type in the U. S. National Herbarium, Nos. 2,279,649 and 2,279,650, collected some 60 miles west-southwest of Guayaquil, Ecuador, altitude 3400 feet, April 1, 1956, by H. Teuscher (No. 2106-56) and flowered in the Montreal Botanical Garden in July 1959. The combination of dense inflorescence, globose spikes and tough persistent sepals distinguishes Guzmania teuscheri from other species of the genus. In fact it more closely resembles Vriesia capituligera (see L. B. Smith, Bromeliaceae of Columbia, p. 195, fig. 55), but is quickly distinguished by its rounded leaf-tips, the dense whitish scales of leaves and bracts, and the shorter inflorescence and primary bracts. If you are interested in obtaining seed, write to Mrs. Meade Goodloe, 2015 North Bronson Avenue, Hollywood 28, California, who has a number of various kinds which she has for sale at 50c a packet. If you have any seed which you would like to donate to the Society, it would be greatly appreciated, for Mrs. Goodloe has many requests from members all over the world. Except for one newly-arrived lot of Ae. bromelifolia, the stock of seed on hand is of doubtful age and questionable viability. Donations of fresh, viable seed will, therefore, be most welcome. When writing to Mrs. Goodloe, please enclose a stamped, addressed envelope for your reply. Of all the states that border the south, California is the only one in which some member of the bromeliad family does not grow natively. From Florida, where the exuberant Ponce de Leon caught his beard on a cypress tree while pursuing an Indian maid and left a memento of his adventures in the shape of Spanish Moss, to Arizona, where the desert-loving Tillandsia recurvata is occasionally seen, the bromeliad has made its home. Why this plant did not migrate to the popular state of California has never been fully determined, for it has been found growing in Baja California. But despite the fact that the bromeliad did not want to grow in California, it has become, through the insistence of plant lovers, a favorite denizen in Southland gardens and greenhouses. Who brought the first bromeliads to California? We do not know for certain, but it is likely that the pineapple was the first of this remarkable family to settle here. The Spanish missionaries were the first horticulturists in California; it was they who demonstrated to the world that many of the plants associated with warmer climes could be grown here successfully. When the first Americans came to Southern California in the 1830's they were amazed at the luxuriant aspect of the vegetation and immediately endeavored to grow all the tropical fruits which they could obtain, one of which must have been the pineapple, for shortly after California entered the Union, mention was made in eastern newspapers of the pineapples that were growing in Los Angeles. As there is no record of the Spanish having cultivated the pineapple, it is safe to assume that it was introduced from the East by American pioneers, for pineapples were a popular greenhouse plant at that time. Little is known of the cultivation of the pineapple in California until the nineties. In 1891 two ambitious nurserymen decided to grow them commercially in Hollywood. A Mr. Rapp, whose growing fields were in the frost-free Cahuenga Valley, was able to produce fruits that weighed four pounds. Jacob Miller, residing in the same area, predicted in 1891 that "the traveler who comes here two years hence, will find the pineapple growing as an ornamental plant in many a lawn and garden in this country." In Pasadena, also, during this decade there was an attempt to grow pineapples as a crop. Experimentation with pineapples was also under way in Santa Barbara. Kenton Stevens in his catalogue of 1893 offered such varieties as the "Red Spanish Pine," "The Egyptian Queen," the "Green Leaved Sugar Loaf," and others and Dr. Franceschi the eminent Italian horticulturist who lived in Santa Barbara at that time, was much interested in their cultivation. In 1900 a grower in Coronado, a suburb of San Diego, filled a lath house one hundred feet square with pineapples and produced fruit of good size. A number of other experimental growings were made, but in later years interest in the pineapple disappeared. The first record of a bromeliad growing in a garden purely for decorative purposes was a reference made to Pitcairnia corallina, which was growing in Santa Barbara in 1880. Dr. Franceschi's first catalogue issued in the mid-nineties offered Billbergia decora from Peru, which he described as having "leaves two feet long, with wide transverse bands underneath, the flowers greenish, accompanied by showy pink bracts." He also had for sale Dyckia altissima from Brazil, Puya chilensis and three other Puyas species from Chile. 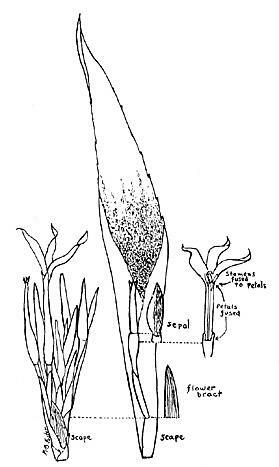 By 1910 Billbergia nutans was a common garden subject throughout the South, arriving, however, as a greenhouse plant. 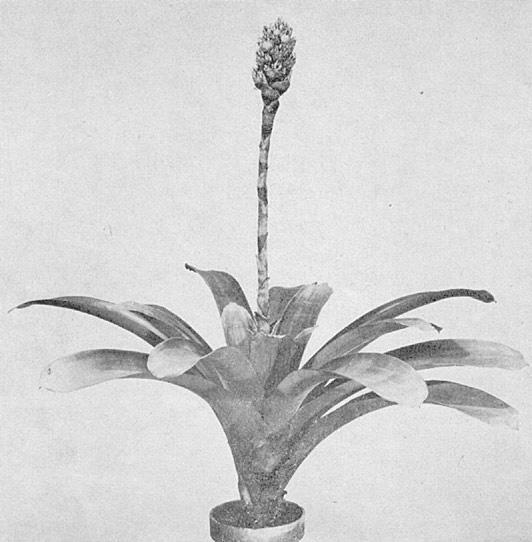 Bromelia fastuosa and Bromelia pinguin were also occasionally seen in gardens in and around Santa Barbara in 1900. 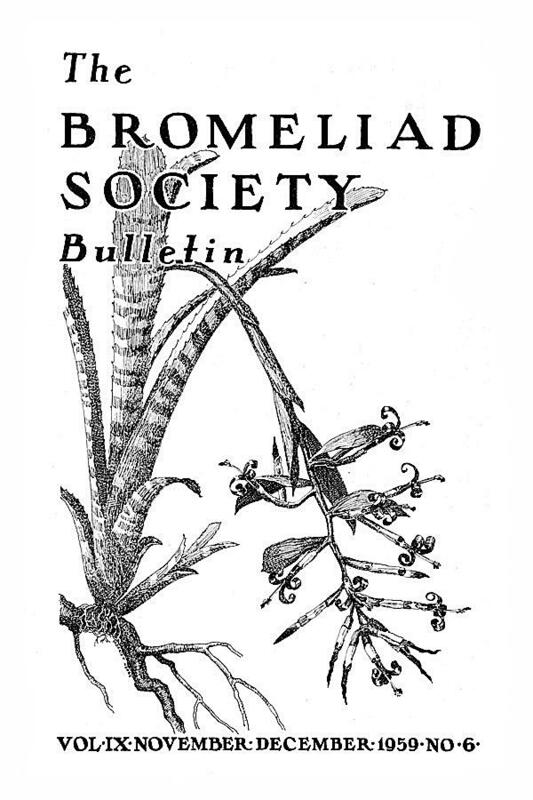 During the early years of the twentieth century several plantsmen in San Diego County became interested in bromeliads. One of the most enthusiastic growers was W. I. Beecroft of Escondido, who imported from England, France and Germany Aechmea fasciata and Vriesia splendens and such Billbergias, as B. zebrina, B. lietzei, and B. saundersii. 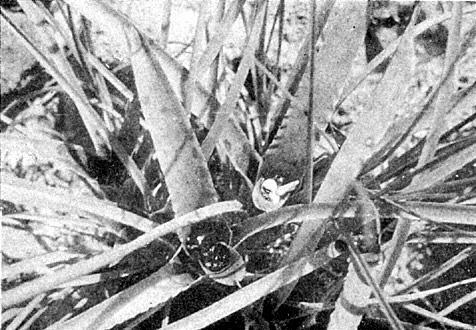 Theodore Meade of Oviedo, Florida, sent Beecroft his bigeneric cross, Billbergia nutans x Cryptanthus beuckeri, which Beecroft offered to the trade. Another grower to become interested in these plants was Charles L. Cass, a succulent specialist of San Diego. He was especially interested in Billbergias and made a number of fine crosses, many of which are to be seen in California gardens today. Unfortunately, Mr. Cass, who died in 1952, kept no record of the work which he had carried on for almost thirty years. The thirties showed a marked increase in the interest in bromeliads. In 1932 such Aechmeas as Ae. fasciata, Ae. fulgens discolor, Ae. miniata discolor, Ae. weilbachii, Ae. pineliana, Ae. Nudicaulis, and Ae. mexicana were being offered for sale in Santa Barbara. Nidulariums and Neoregelias also made their debut into California horticulture during the early thirties. In 1932 Puya chilensis was introduced into the United States by William Hertrich who planted it among the great desert collection in the Huntington Estate in San Marino. In 1938 E. O. Orpet, of Santa Barbara, obtained seeds of an unknown plant from a stranger who had lately been in South America. This plant turned out to be the strikingly beautiful Puya alpestris, a bromeliad which never fails to win admiration. 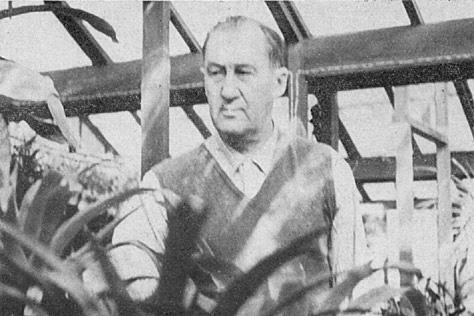 The late Morris Schick of Glendale, one-time director of the Bromeliad Society, was one of the first to sell bromeliads in the Los Angeles area. Probably the one plantsman who did more than any other to arouse interest in the bromeliad family was the late Richard G. Atkinson of Leucadia. He brought together about two hundred species and numerous varieties and hybrids–the first sizable collection to be grown in the South. He was an exceptionally fine grower, his methods being such that he was able to flower Billbergias inside of thirty months from time of sowing. Upon his death, the collection passed into several hands, the outstanding being the nursery of Evans and Reeves, of West Los Angeles. Featuring bromeliads with their orchids, fuschias and ferns, in their large lathhouse, this nursery was instrumental in distributing many bromeliads throughout the South. Especially famous was their plant of Aechmea fasciata, grown as a clump in a rockery. The plant weathered many hard winters and every summer produced flower heads measuring a good seven inches in width. The outstanding bromel authority in recent years has been David Barry, Jr., who started his collecting in the thirties. Through his travels and his constant contact with botanic gardens and growers in all parts of the world, Mr. Barry has been able to assemble a collection second to none in California. Recently he has turned his hand to hybridizing and is producing a number of plants of rare interest. James N. Giridlian, of the Oakhurst Gardens in Arcadia, has since the forties featured bromeliads with his rare bulbous materials. At present he maintains a complete stock of bromeliads of all sorts, although his Billbergias, which he grows under his beautiful oak trees, are outstanding. Recently Fritz Kubisch of Culver City has become known for the many unusual Tillandsias which he offers for sale. Mr. Kubisch yearly takes trips to the jungles of Mexico to gather unusual specimens, which he delights in displaying at the various flower shows. Since World War II interest in bromeliads has been keen in Southern California, and it was the enthusiasm of a number of amateur growers residing in and around Los Angeles that prompted the formation of the Bromeliad Society. Today bromeliads are being seen in more and more nurseries. Also they are being used in commercial planting, and bromeliad trees are becoming a part of window, restaurant, and store decoration. 647 South Saltair Are., Los Angeles, California. From Hawaii comes a Kauai Cookbook prepared by the Kekaha Parent-Teachers' Association for the benefit of local school children; it is a most complete collection of International recipes, representing a cross section of the many races that make up the population of Kauai. (Garden Island Pub. Co., Ltd. Lihue, Kauai, Hawaii). The colorful cover is a kodachrome taken by Hector Moir, of Bromelia fastuosa, known more commonly as "Heart of Flame". Unfortunately the specific name fastuosa is a synonym of either B. pinguin or B. antiacantha and thus perpetuates another misnomer. BUT, nevertheless, it was a happy choice to make a cookbook sell; the flaming bracts and white head resemble a confection good enough to eat! The December 1959 HOUSE & GARDEN magazine (420 Lexington Ave., New York 17,-50c) on p. 166 features a Bromeliad Tree in its suggestions of "5 gifts for gardeners who think they have everything". Gift #1 is a bromeliad tree illustrated, by a good sized photo. Familiar bromeliads in genera Aechmea, a Neoregelia, Cryptanthus and Billbergia (and one not so familiar, Wittrockia) grace the simple contours of a black locust stump, into which holes have been drilled for harboring the epiphytes. A page of instructions on how to do this make it a feasible feature for any ambitious gardener. L. A. Examiner's Pictorial Living Nov. 1, 1959, pages 30-31, article about Fritz Kubisch and his bromeliad collecting. Three colored close-ups on Page 37 of bromeliad inflorescences, colored photos and one black and white, showing Guzmania minor, Vriesia x "Marie", a hybrid Vriesia and Tillandsia bulbosa. It is gratifying to realize that this newspaper magazine section has found bromeliads decorative enough to have devoted, pages on several occasions to them. Soon so much interest will have .been aroused that the supply will not meet the demand . . . or is that the situation now? For hours we had been cutting our way through a dry, brambly jungle out in Mato Grosso and at last we had found a haven for rest. Suddenly, we looked up into the forest "penthouse" above us. A rustle of leaves and vigorous swaying of branches focused our attention on a spry Capuchin monkey; something was wrong in his world! Without asking, we had intruded into his domain, had entered his dining-room to eat our lunch. He wasn't too certain what to do about it. He leaped down three flights, from "floor to floor" of his jungle home to investigate these visitors more thoroughly. As we watched him we were reminded, as we had been many times before, of the structural character of the Brazilian jungle. While the jungle forests seem endlessly varied, always they seem patterned or blueprinted in the form of a great building with one, two, three, or even four "stories" of growth. In the great Cerrado or Catinga (scrub lands) only the first floor of vegetation occurs, but in the great primeval forests in various mountain ranges, such as the Serra das Aymores, the Serra do Mar, or the Serra da Mantigueira, we always observed three or four distinct stories, with even a "penthouse" above. The strata of plant growth are more or less comparable to strata of rock formation, and it is singularly interesting to note how strictly the plants which grow in the trees keep to their own strata. Seldom do you find a given plant growing in more than one of these areas. The ground floor of course is always more easily observed than any of the others. For the most part the plants on the first floor of the big forest are lush, the leaves are broad, of more tender and rapid growth, and the plants are naturally shade-loving. They are likely to be a tangled mass of ferns, calatheas, tradescantias, heliconias, pipers or bromeliads. As I am especially interested in the bromeliads, I am naturally more aware of the strata in which these particular plants grow, though they follow a pattern of habitat similar to that of other epiphytic forms such as orchids, cacti, ferns, and pipers. In fact, my own blueprint of the jungle growth is based mainly on the habitats of bromeliads. Neoregelia, Nidularium and Canistrum are three bromeliaceous genera which can be found on the first floor of growth, since they like the moisture and shade of the lowest parts. Seldom do they ever venture high above the ground, but actually the ground is often so crowded with verdant growth of other plants that they do seek the low trunks, stumps, or low-slung lianas. And strangely, the vegetative growth of these particular bromeliads is more luxuriant and showy, while the flowers and fruits of these plants are less spectacular than on those that grow higher up. The conditions in the shadows of the rain forests make these plants well adaptable for corners and neglected places of the greenhouse or conservatory and shaded parts of a home. I generally place most of my Nidulariums, Canistrums or Neoregelias under slat benches or under other foliage plants in my greenhouse for they are much less inclined to grow out of form and shape than plants which strive harder to reach the light. The ground floor in the jungle, of course, acts also as a starting point or foot-hold for climbing plants which sometimes go on up to the roof. Although many of the luxuriantly growing plants of the first floor covering have the ability to outgrow and overshadow other growth in almost complete shade, in horticultural use they generally are less adaptable to sudden changes in temperature and light than those in the upper strata. These first floor plants of the jungle, such as Nidulariums, calatheas, ferns, and others, require, as a rule, more constant conditions. On the other hand, some of the plants, like the aroids and other climbers which have their feet on the first floor, adjust themselves to various levels. They defy any of the other growth to outdo them, so they get off the ground and take to the spaciousness of the trees. Thus, because of this resourcefulness to rise above their conditions, they often become more adaptable under artificial conditions as house plants. They are prepared in nature for a transition to the cave-dweller conditions of a home. So, we continuously search for plants that can stand shade and the heated room, and that have the ability to stay with people whom it is often difficult to understand. In many jungles the foliage of the cacaos and other low-branched trees makes the roof covering of the first floor. In practically every jungle area in Brazil the willowy cecropias serve as the roof of the first and second story of the growth. They are usually on the edge of the dense jungle and seem to act as nurses who stand in readiness to protect the tender growth below them, should anything happen to the dense, high "roof" proper. The great, broad palmate leaves of these rapidly growing cecropias protect the young seedlings of other plants until they are able to take care of themselves. Among the bromeliads, species of Billbergia, Vriesia, many of Aechmea and some of Tillandsia have taken residence on the second floor. Occasionally a Quesnelia, Hohenbergia or a Streptocalyx also may have chosen this area. These plants are a bit more independent of moist conditions and enjoy more light than their first floor cousins. Consequently, they are inclined to be more showy in form and flower. The tree-tops of this level are more open and enough light filters through to create a situation that will harbor plants, especially bromeliads, which are favorable to green-house, sunporch or patio conditions. They do not need quite so much moist atmosphere or diligent attention as those growing lower down. Here in the more open second floor we find many of the climbing and vine-like palms, and the tree-like species of Opuntia. These cacti which stand with their feet in the acid-leaf-mold and enjoy the forest shade are only just beginning, in the course of their evolution, to show the typical succulent pads of their desert relatives. The layman thinks of cacti as being almost exclusively residents of the desert, and while this may be more or less true in Mexico and our Southwest, it is not entirely so in Brazil. South American jungles must have been the original home of that great family for we still find a predominance of the earlier leafy forms of cacti there. Rhipsalis, Hatiora, Zygocactus, and other genera of epiphytic cacti abound in most jungle areas of Brazil, being habitues of the second floor along with Aechmea, Billbergia and Vriesia of the bromeliads. The well-known Zygocactus (Christmas cactus) grows happily on the first and second floor in the moist shade of the coolest jungles. On the third floor of any given Brazilian jungle, will be found a predominance of Aechmea, a stiffer and sterner type of bromeliad which is seeking more light and more air currents. Of course, Vriesia and Tillandsia will be found here, also, on the "mezzanine" between second and third floor, as it were, made up of the lower limbs of the giant trees whose leaf heads form the roof and penthouse areas above. Some of our most interesting discoveries were found in this third floor stratum, the structure of which is made up of great limbs of the towering forest trees which throw out their far-reaching branches, filtering the light for trees and vegetation below. Here in these giant trees we find giant bromeliads; in size some of them are so immense that one wonders why they have not taken to the ground instead. It was in southern Bahia in a primeval forest back from Ilheos, when we discovered the two new species, Aechmea conifera and Aechmea depressa, that we had our first experience in seeing really giant plants completely at ease fastened securely in their high, lofty positions on limbs almost as large as ordinary trees, 80 feet up from the ground. The trees in which they live are often eight to ten feet in diameter. To reach these air plants we had to do as the monkey does. First we climbed into the trees of the first and second floors, their branches intermeshed with the taller trees of the second and third floors. From limb to limb with the help of great swinging vines we finally reached the third floor, or the lower branches of the largest trees. It is no easy job; in fact, sometimes it takes from one to two hours to successfully reach those plants and loosen them from their secure quarters. Lowering them with ropes and bringing them to earth, we finally realized their immense size. Aechmea conifera had a cone-like flower head which, when fully developed, was eighteen inches long and weighed twelve pounds. One of these plants with its several side shoots and its partly cast off previous growth may weigh 100 to 125 pounds. And right in this one mass of plant life there is plenty of interest in other forms of life for the ranologist, herpetologist, entomologist, and botanist, because frogs, snakes, and beetles, as well as aquatic mosses and algae, make up the great variety of life in the little universe in the series of pools within the leaf cups of one great epiphyte. These giant air plants, in spite of the animals and the one or two gallons of water they hold, hang on securely with their wire-like roots in a perfect balancing act. The character of the fourth story is more open and thereby more sparsely inhabited by bromeliads. The higher the area the stiffer and more rugged the bromeliad. If the plant holds water in its basal leaf-cups, the leaves may have more spines; but if the plants (like the xerophytic tillandsias) do not hold water between their leaves, then their bodies will be covered with countless peltate scales. These scales serve both as an insulation against sun and wind and act also as sponge cups to soak up moisture from the cool, dewy air. Naturally these higher stratum air plants are the most independent of all the plants. That is, they are independent of what we generally term as favorable conditions. As house plants they are, however, quite, susceptible to excessive coddling, often succumbing quickly to too much moisture, for they have developed their xerophytic qualities on a parallel with desert dwellers and cannot stand a "soft" life. For example, Tillandsia recurvata (ball moss), has become so conditioned and hardened that it could be called a xerophytic or saxicolous plant as well as an epiphytic one, finding lodging on desert cacti or among rocks quite as comfortably as on trees in temperate or tropical zones. This Tillandsia has probably the greatest adaptability of any plant in the Western Hemisphere. Many of the tropical plants, especially those growing at some elevation in the mountains are what we would call coolhouse plants, for at home they have heat only in the middle of the day. I often wish that more growers, especially those who are confined to greenhouses in the north, could personally experience these jungles and feel the many conditions under which the plants live. And, since many of the epiphytes love cool nights, they seem quite remarkable in their adaptability to withstand the hothouse' treatment day and night that they receive when confined far from their native arboreal air gardens. They like more air than we are inclined to give them, and more variation in temperature. Plants which are fastened in one position through their life must have plenty of exercise. How can a plant have exercise? By raising and lowering of temperature, by alternating drying out and watering periods; these changes, mixed with good, pure ventilation will keep a plant active and in vigorous health. There are often conditions even in the forest which are detrimental to some of the plants some of the time. The vitality of certain ones is lowered and we find scale and other insects there, but where the plants have the proper exercise and ventilation with their natural source of food you find them endowed with a much greater resistance and fewer insect enemies that you find when they are confined in a glasshouse. Unfortunately, bromeliads and orchids as greenhouse or house plants cannot always get the rain water which means so much to them and often must get along on chemically treated water which has the very life taken out of it. That many of them hold up remarkably well under this deficiency in their diet demands our great admiration. One caution is important: bromeliads and orchids cannot thrive very long with excessively alkaline water. I believe also that epiphytic plants in the greenhouse should have the association of other kinds of plant growth around them. Human beings cannot live without plants, neither can plants live without other plants, but we are quite sure that plants can live without human beings. Little do we know of the beneficial gaseous atmosphere that is given out by the various plants. Some plants may give off ethylene (a gas in wood smoke) which has been proved to have an action on bromeliads in that it forces them to bloom out of season. What gases are given off and what their resultant actions are present a vast field for investigation. When one thoughtfully surveys the different stories of the jungle growth, its inhabitants, and its living conditions from the perspective of the first "floor" one realizes that the great mass of epiphytic life clinging to the trunks and overhanging branches forms a garden quite removed from the earth, a garden "in suspension." The successive strata or stories of vegetation, in which different types of epiphytic plants make their homes give the jungle its blueprint, or pattern. Rt. 3, Box 658, Orlando, Florida. ". . . . These are presumed to be Atkinson crosses. It is a matter of record, corroborated by reliable authority, that all material Richard C. Atkinson used in his work of hybridizing Billbergias, was purchased from Charles L. Cass of San Diego. We are pleased to record data pertaining to these crosses . . . . .
. . . . 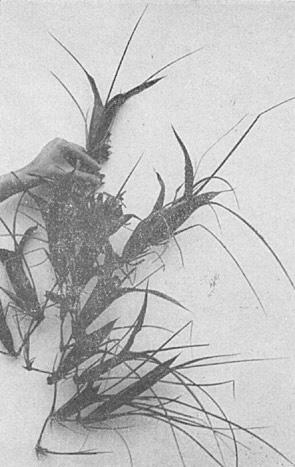 It was determined that one parent of extreme importance used by both Mr. Atkinson and Mr. Cass in their hybridizing is a Billbergia which was imported approximately thirty years ago by the late W. I. Beecroft of Escondido, as B. Moreli, and sold as such by him and others for about five years until an un-named botanist asserted that its correct name was B. amoena and that name has since been used exclusively for twenty-five years. Another Billbergia used as a parent is B. pyramidalis. This Billbergia is often confused with B. thyrsoidea, the flowers of which also bloom erect. Most of the Billbergias producing erect blossoms during July and August seem to be crosses between B. pyramidalis, B. amoena and B. Saundersii. There has been a variance in the foliage, some having colored blotches or spots. In all probability, the spotted trait comes from B. Saundersii. Our thanks are extended to Charles L. Cass for his invaluable help in explaining the early crosses." The things that one takes for granted are generally the things one really knows the least about. For instance, Spanish moss. Did you know that it is not a parasite? And somewhere I've read–but I've never believed it–that Spanish moss belongs to the pineapple family. No, Spanish moss isn't a parasite. It is an air-feeding plant which is not harmful to the trees on which it lodges so gracefully. You can get proof of this and a lot more information about Spanish moss in an interesting little booklet just published by Raymond J. Martinez, who has written many things about New Orleans and its environs. Mr. Martinez's latest is entitled "The Story of Spanish Moss" and it discusses the area in which moss grows, its propagation, its uses, especially commercially, how it is cured, and other little known (to me, at least) facts about Spanish moss. Spanish moss, Mr. Martinez points out in his opening paragraph, is an epiphyte, which, according to my dictionary, is "a plant which grows upon another, but does not get food, water or minerals from it." So, you see, it isn't a parasite on the cypress, gum, oak, elms and pecan trees it so liberally festoons in South Louisiana. While stressing that Spanish moss does not live off these trees, Mr. Martinez says, "Its presence on pecan trees tends to reduce the yield, owing, no doubt, to the fact that to some extent it shadows the buds of the fruit." He recounts how the Indians called moss "itla-okla" or "tree hair" and how the French called it "Spanish Beard" and the Spanish called it "French Hair". The accepted name for it is Spanish moss. Oddly enough, moss isn't propagated by seeds, Mr. Martinez states, but by fragments or festoons, which are carried from tree to tree by birds and the winds. Moss needs no more diet than the moisture and dust from the air. For many years Spanish moss was used in Louisiana for upholstery and for stuffing mattresses, and at one time, back in 1927, more than $2,500,000 of moss was shipped out of Louisiana. There has been a steady decline, Mr. Martinez says, "owing primarily to increased use of cheaper imported fibres, such as sisal from Mexico, and the increased use of resilient rubber pads." The author declares that at the present rate of decline the moss industry in Louisiana will be negligible by 1961, unless a promotional campaign of some kind is organized. Moss was once used as a binder in mud, clay or cement for building houses . . . Spanish moss will only grow on trees. It will not grow on vines, wooden fences, fence posts, wire fences, telephone poles, buildings or any other place except a tree . . . Spanish moss fresh from the tree is eaten by live stock during the winter in much the same manner that hay is consumed . . . Curing is a long process . . . from three to four months. The curing of moss reduces the weight by approximately 75 per cent . . . Louisiana and Florida are the only states handling moss commercially . . . Ninety-eight percent of commercial moss is shipped to upholsterers in the North, East and West . . . Spanish moss grows in the area comprising the extreme southern portion of Virginia and the Gulf coast from Florida to Texas. It is commercially present, however, only in Louisiana and Florida where rainfall and temperatures are conducive to its growth . . . No insects will attack moss fibre, eat, destroy or live in it, and it is highly resilient, hence its desirability for upholstery . . . Believe it, or not, moss is not a cheap filler for furniture or cushions, because of loss of weight with each step of curing. I trust that you have now learned things about Spanish moss that you didn't know until now, even as I, and I can assure you that you'll find Raymond Martinez's "The Story of Spanish Moss" a very interesting little booklet. Incidentally, the official title for Spanish moss is tillandsia usneoides. The "tillandsia" comes from the name of a Swedish botanist, Tillands, but I haven't got the slightest idea how it came by the "usneoides." Nor did two dictionaries and one desk encyclopedia seem to know either. Editor's note– For the enlightenment of Mr. Dufour, and, for that matter, some of the rest of us, too, Mr. Smith adds the welcome bit of information that the "usneoides" means "like, or resembling an usnea" (a form of lichen). Mr. John M. Riley of Palo Alto, California, reports that his uncle recalled that, out in Texas, when the winter was bitter and cattle forage scarce, the ranchers had to cut down big trees so that the cattle could feed on the Spanish Moss in those trees. "Undoubtedly, firewood and timber was a second motive," says Mr. Riley, "but Uncle indicated that cattle subsisted on the Spanish Moss at various times." "While we think of the Tillandsia usneoides as preferring moist areas and wishing to be relatively near the coast, my uncle's ranch was located 150 miles inland, roughly due north of Houston, a locality which gets hot and dry in summer." 914 E. Meadow Dr., Palo Alto, Calif.
Spanish Moss helped meet another emergency. The Florida sand in orange groves is sometimes pretty stubborn, especially if the driver of a car is equally stubborn in grinding his wheels into it. After a half hour's fruitless effort bromeliad-minded Racine slogged through the drifts of sand to tell the stranded people that their means of rescue was at hand . . . on the trees surrounding the grove. They were full of disbelief until she showed them by example that streamers of Spanish Moss piled into the ruts will provide traction to even the most reluctant car wheel. What that "Grey Beard" has done for us humans!